Having defined our Legal Entities, we can now focus on the Business Group. What is a Business Group? A Business Group is essentially a Human Resources organization, to which we assign employees. The Business group, as an organization is used to represents the entire corporation or the enterprise, or a major division in the organization structure. From an HR perspective, the Business Group is used to secure Human Resources information. 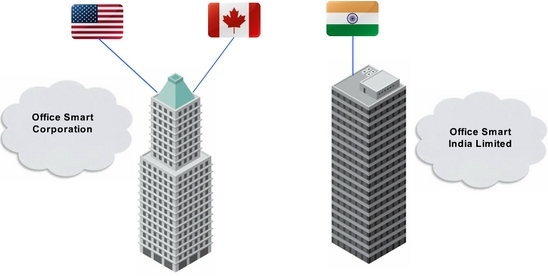 Office Smart has a single Business Group for the US and Canada, called Office Smart Corporation. So, if a manager in one of Office Smart’s US offices wants to review employee information, she will have access to all employees assigned to the North American Business group. However, if HR is installed, then employee information can be secured at a more granular level. We will briefly discuss HR Security, in a later session, but a detailed discussion of securing employee data in HR is beyond the scope of the multi org setup project. A Business Group enables us to group and manage data in accordance with country-specific rules and reporting requirements. If country specific legislation is very different, as is usually the case then it may be necessary to create a separate Business Group for each country, where the business exists. Office Smart made a decision to consolidate its operations in the US and Canada under a single Business Group – Office Smart Corporation. However, the legislation and reporting requirements in India are very different from those in North America. Therefore, a separate Business group had to be created in India – Office Smart India Limited. Why Define Business Groups before Primary Ledgers and Operating Units? In creating the multiple organization setup, there is no "carved in stone" commandment to define Business Groups before defining the Primary Ledger. However, once we begin defining a Primary Ledger using the Accounting Setup Manager, it is efficient to continue the configuration flow by defining the Operating Units under Accounting Options. 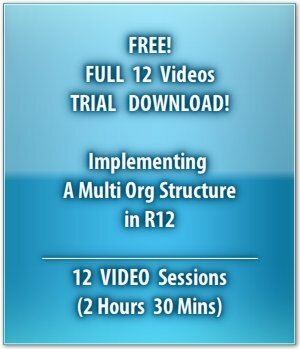 But, in Release 12 it is mandatory to associate an Operating Unit to a Business Group, when creating the Operating Unit. Therefore, after we emerge from creating a Legal Entity, and before we dip our hands back into the Accounting Setup Manager, it is convenient to define the Business group. 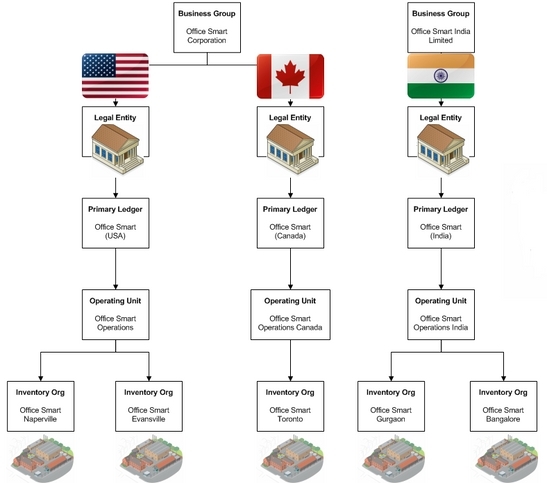 In the multiple organization structure pyramid, the Business Group is not dependent on the creation of any other entity. Which is why, it can be created any time before we start defining Operating Units. However, it is a good practice to define Legal Entities before we delve into Business Groups. This Audio-Video Demo has 12 Sessions, and plays with full functionality for 45 days, from the date of first use. By clicking on Add to Cart or View Cart, you accept the Terms and Conditions.